Hindusthan Educational and Charitable Trust, one of the finest in education and teaching is strategically placed in the heart of the city, and since 1992 has established itself firmly in the fields of Arts, Science, Education and Technical Education. The Trust aims at providing education that is world-class and on par with global standards. The Trust firmlThe Management has always stood by its commitment to the betterment of the student community and had at first established itself as a brand in the ‘power sector’, and today in the field of Education has reigned supreme with the ‘Life Time Education Achievement Award’ for giving back to society. The Management believes in leading and has set new trends/ innovative training methodologies in all its Institutions that will assist students towards the road to success. In 1975, Shri.T.S.R. 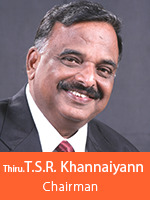 Khannaiyann began his career in trading Electromagnetic Equipments. Later he became a successful industrialist by manufacturing power transformers. His concentration, innovation, organization and communication skills earned him the “Best Entrepreneur” award. In 1992 he started “The Hindusthan Educational and Charitable Trust” to serve the youth and humanity and this vision is being fulfilled through the Hindusthan Educational Institutions. His outstanding caliber has rewarded him with the “Kongu Rathna” Award. In 2010, “The Life Time Education Achievement Award” was conferred on him for the service to the student community. Smt. 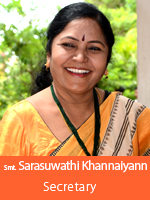 Sarasuwathi Khannaiyann’s hardwork to see big pictures and not getting stuck with ego has made her the legend in the success story of Hindusthan Educational Institutions. Her multi skill personality, with administrative power has made her an icon among women in managing educational affairs. She believes that whatever we do should be done with passion and this has earned her the ‘Best Women Entrepreneur’ of Coimbatore in 2006. Her individual achievement has been recognized through the ‘Rajiv Gandhi Shiromani’ award and ‘Bharat Gavrar and Sadbhavana’ award in 2010 for her distinguished service to the nation. Mr.K. 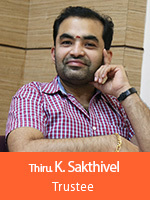 Sakthivel, graduated as an Engineer but turned outstanding young administrator. He has created a revolution in Youth education. An enthusiastic and energetic engineer has played a major role in muting the HIECT. His contribution by motivating the youth to participate and his play is phenomenal and adds to the success of Hindusthan Educational Institutions. 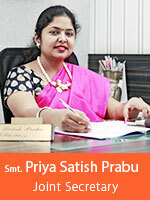 Dr. Priya Satish Prabhu an engineer with an MBA, is a pleasant and pleasing personality with high managerial skills. Her respect for human values and encouragement for innovative ideas is an important factor for the growth of Hindusthan Educational Institutions. Her effort in empowering and employing the youth should be highly appreciated. As a young women icon, she leads the academics with confidence and courage.